The competition was opened by the Sivas Municipality for the design of 6 million square meters of land by the Kızılırmak River in Sivas. Kızılırmak is the longest river entirely within Turkey and until today it acted as a barrier dividing the city Sivas. 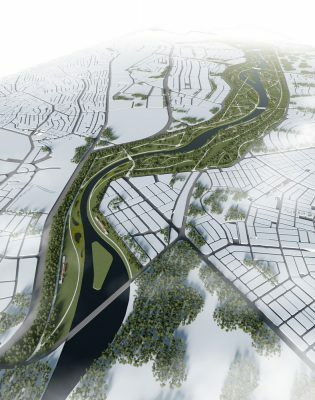 The competition aim was to bring together the two sides of the river with a holistic urban design along with recreational and cultural design elements. The competition was a pre-selected competition and eight groups were chosen for the second stage. The city of Sivas, located in Kızılırmak section of the Central Anatolia Region, has always been an important transit point, a focal spot and a settlement throughout history as a result of its geographical features. Under the rule of different states such as Hittite, Roman, Seljuk and Ottoman, the city’s morphology and sociocultural identity has changed over time, depending on the population movement as well as military and political processes. Kızılırmak River’s impact on the urban life has remained limited due to parameters like security and accessibility, for this reason it has been characterized as a natural threshold with the separation displaced from the city perimeters. Nowadays keeping the flood area under control with the reclamation studies brings up the opportunity and possibility to redefine the city macroform. In the near future it is predicted for Kızılırmak Corridor to play a lead role on the ecological diversity, the recreational potential and the scale defining areas reserved for sociocultural function set. In this study, it has been envisioned to bring the city and the citizens with this particular water footprint while having a protect-use vision. It is essential to plan the landuse for the sustainable resource consumption, considering a protect – use balance since the demand for converting these areas with high natural potential to recreational areas raises day by day. As presenting the proposals, in order to develop proper design options that last for the next generations, the approach of “sustainable design and management with nature” has been sought considering the protect – use balance of natural values. The design of the project area (as an ecological and recreational spine) is considered a very important opportunity from a “more livable Sivas” perspective. • One of the main objectives of the design is to bring Kızılırmak under control in the project area in order to prevent having an unstable flow and to solve the flood problem. In this regard it is crucial to consider the streams and rivers that downstream Kızılırmak within the design context. 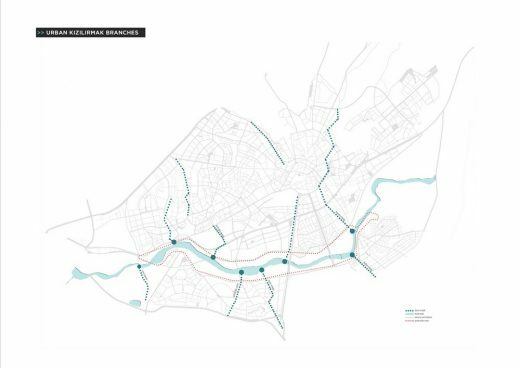 • The pedestrian access on the settlement and the developing areas is planned to shift through the riverfront by a variety of functional corridors. The efficiency of the pedestrianisation is crucial for the city-water relation. Water is an important resource in terms of creating a micro climate in the city and present different possibilities for urban areas. The pedestrian access plays an important part on using this resource. • Kızılırmak does not reveal a constant flow rate with the melting snow and rainwater along with being a river fed by the water of side streams. It is the project’s aim to form a relation between the water and the citizen in every season. • Considering the “Superior Public Interest” principal, instead of a passive, rural approach of protection through Kızılırmak, it should be a part of the urban landscape. This approach allows the blue-green life corridors to become more active in the city with the active usage of the citizens. The project area is treated as the first step of this approach, and for the coming years the ecological corridor should be carried on all through Kızılırmak. • Ecological corridors have great importance considering the transition zones between its most significant components, the wetlands, terrestrial and aquatic ecosystem; their ecological features and the biome they obtain. They are the most important ecosystems with their natural functions and economic values, along with the habitat they create for many living creature, especially the water birds. In accordance to that, the wetlands are planned as habitable spaces. • Sivas city center section of the project site on Kızılırmak is a part of the ecological corridor. The area should not be designed without acknowledging the corridor entirely or taking the streams extending to the periphery into consideration. 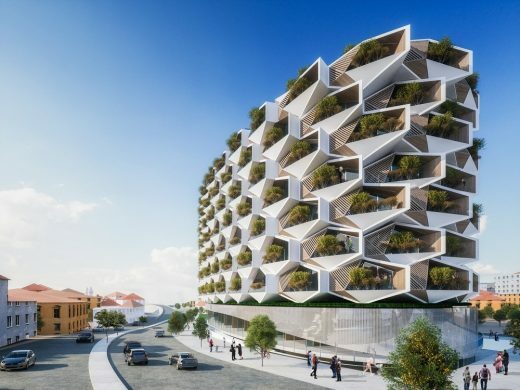 Each design decision to be taken on the site must prevent the interruption or derogation of the conditions that this ecological spine carries, filters, provides a life, food, shelter and reproduction environment. • As the river corridors present a biodiversity they also create various climatic characters from the environment. They can produce their own air stream while having the local air streams. The air moving upwards from the valley ground in the early morning hours is reversed during the night. These air movements, with the help from the ecological corridors integrated with the city through Kızılırmak what is called as the ecological spine, carry the polluted air and replace it with the fresh air. • There are tourist attraction points (workshops, outdoor exhibition halls, sociocultural facilities, installations, etc.) regarding the local users’ needs. • The cultural activity areas are designed in a way that creates lively spaces for all seasons with a variety of activities. • The wetlands make eco-tourism possible by having natural areas with the qualified biodiversity. With the observation terraces, the bird species can be observed in their habitat and different natural perspectives can be captured by the nature photographers. For the ease of application it is envisaged to design the area in phases. There are five phases planned in this regard, however during the application some phases may be merged if necessary. The site is zoned and shaped by the protect-use policy, which is one of the highlights of the design. The zoning and the shaping is planned according to the event and function calendar, the transportation and land use analyses. From all these zoning and shaping in the project site and inbetween of these stains the main transportation line finds its form. Described as a green spine, Kızılırmak is surrounded by many functions like a DNA helix. In regards to the size and maintenance of the site it is planned to plant and sale local vegetations on the fields in the near surroundings. Unlike the north axis that carries the traces from the urban tissue of the site’s northern parts, in order to distance itself from the physical and visual barrier created by the high speed rail line, the south axis carries the dynamic and fluid line of Kızılırmak. The northern riverside hosts a perimeter the city can densely interact with. The main axis in the north is shaped by border of the buffer zone and the cracked form of the masterplan. The northern buffer zone contains bicycle route, pavements, parking areas and the tram line while the southern buffer zone contains bicycle route, pavements and parking areas. The buffer zone serves as a filter with the dense green tissue. It faces the squares vertically entering to the site from the city like a wall. All the traces from the city (pavements – pedestrian paths – squares) passing through the northern buffer zone to reach to the main axis connects the secondary pedestrian paths / service roads on the northern side of Kızılırmak according to the needs and orientations of the design. Creating an almost-complete barrier effect on the covered area, the buffer zone in the south side is created to conceal the high speed rail line, the artificial boundary element. Although it is generally located in a higher level, it is one of the most controlled spaces for the safety of the high speed rail line. The access to the southern riverside, the main axis and the facilities achieved through the secondary paths with the service roads and parking lot arrangement at the border with the buffer zone. Unlike the northern one, the main axis in the south is shaped with the fluid form of Kızılırmak for having a narrow space and to reduce the barrier effect of the high speed rail line. Since in both riverfronts the transportation roads are necessary, they can be used to reach every corner of the site. There is a large infrastructure created for the bicycle system encouraged for the site circulation and the city transportation. In both sides a total of 17 kilometers of bicycle line serves the both sides of the city and becomes a part of the main transportation line with the lines coming from the city and the university. There are bicycle renting units at certain points of the city, the university and the project site in order to promote and encourage biking in the project site and the city. The rich ecological wetlands create a fertile living environment, particularly for the fish, water birds and other animals by cleansing the water. Wooden walking paths on the site allow users to spend time in nature. They provide space for educational activities in nature for science classes of the nearby schools. One of the prominent cultural activity spaces is the city library complex with the festival area. The city library is designed to serve both the citizens and the national school students as well as the students from Cumhuriyet University. It functions integrated with the reading gardens, recreational areas, and reading copse nearby. There are also cafes, restaurants and tea gardens in the near surroundings. Towards the riverfront, the urban balcony holds different views for the users over the water. Another activity and culture space is the Sivas City Museum that hosts the historical identity of the city and informs visitors about Sivas’ general history. The museum is designed with its surroundings as an art center complex. The outdoor exhibition hall, the installation areas and the sculpture garden are designed to exhibit works from the urban artists and Cumhuriyet University Fine Arts Faculty member and students. The activity spaces, especially the outdoor organisations in collaboration with the university will be an attraction point for both the citizens and the tourists. Near the museum the local crafts studios and indoor exhibition halls are located. Another focal point is the area called “The City Gate” that contains the high speed train station. For people coming to the city using the high speed train line, recreational areas were created at the station square and urban terraces. Interaction with the riverbank is provided with urban steps. It is also envisioned a tram line that connects the project area, the university campus and the city center has a station in the square near the New Bridge. So the newcomers can reach the city center easily. The station square has functions like cafes and restaurants nearby. One other important cultural spot is a multi purpose hall and its near surroundings. While the hall is planned to house opera and ballet performances as well as theatre plays, it also serves for the events such as weddings and conferences. The near surroundings of the multi purpose hall can be a spot of choice for outside wedding ceremonies and cocktails. Other activity and culture functions are the workshops, exhibition halls and outdoor activity spaces on different spots on the project site. 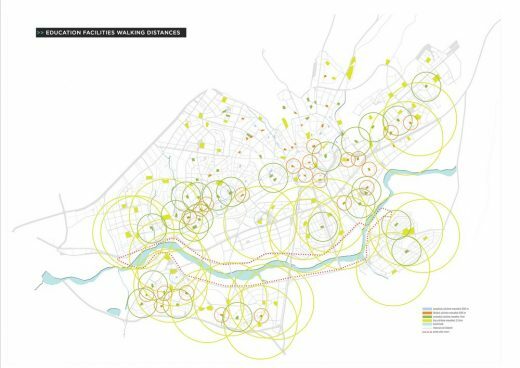 These areas call for relatively small scale spaces all through the site. Especially the workshops are significant units on passing and preserving the culture through new generations. One of the sports activities planned on the site is rowing and canoeing by obtaining a constant flow rate. At the riverfront, the boathouse and rowing club building have steps reaching to the river. While the citizens can use this facility to learn the sports and have fun, the university students can use as a sports club. The recreational spaces spread to the project area are available to all sorts of users. In these areas craft stores, studios and local markets are located alongside the common units like restaurants, cafes, tea gardens, buffets and restrooms. The public recreation facilities spread through the site are designed to meet several needs of the users like restaurants, cafes, tea gardens, buffets, or toilets. In addition to these workshops for arts and crafts and sales units for local products are also designed for the site within a coherent design language. The landscape design of the recreational areas includes picnic areas, seating steps along the river, thematic gardens, aromatic, endemic or medicinal plant gardens. These landscape areas are expected to create different sensations and experiences to users across the year. The area may also be used as an open air exhibition space, especially considering the works of Cumhuriyet University Fine Arts students and Sivas National Sculpture Workshop organized by the University which is adjacent to the site. Furthermore large green spaces and squares in the design may host all kinds of activities, festivals, open air concerts or fairs. Areas contributing to children’s physical development like the skateboard park, the grass slides, the water parks, the adrenaline park and the go-kart field are dispersed around the site. 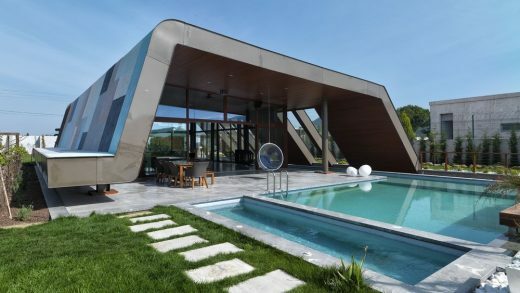 Furthermore, in order to introduce the children with the nature there are some particular areas such as outdoor nature studios and the sound gardens in the project area. Mostly natural materials are used in the outdoor green spaces. With small changes in the topography, the climbing hills and the tumbling pits are created. Among these intense activity centers, there are calm and easeful spaces like the story gardens. On the waterfront there are model boating platforms. Considering the positive influence of the interaction between children and animals, the project contains an outdoor manege and a mini zoo. The most important structures at the kids zone is The Planetarium and the Kids Club. The Planetarium structure projects the images from the outer space to the dome and introduce children with astronomy. In the meantime, the telescopes on the terrace allow children to observe constellations and stargaze. In the Kids Club, both the children’s library and the workshops for children to learn and develop skills are created. The production plots in this area created specifically for the children, it is expected for children to learn the plants and the agricultural processes while consuming their own products. There are two large island formation at present. During the design process these islands are shaped by the design language. In addition to those islands another island is added to the zone near the activities and the festival area. The island added to the activity and festival area stands out with its natural features while serving as a performance area for concerts when needed. The island at the center of the project area is an activity island that connects two sides of the river with pedestrian bridges. The bridges that provide pedestrian and bicycle access are also considered as green bridges that provides the faunal continuity. The sandy areas at both sides of the island provide waterfront plantation as well as different possibilities for the fauna. 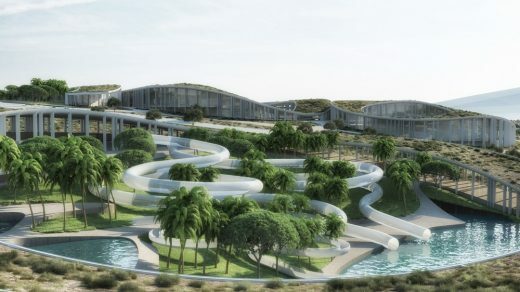 Master plan and concept design for Aegean Breeze at Alaçati, a five-star, contemporary beach destination resort that will broke ground on the western coast of Turkey in 2011, with a grand opening planned in summer 2012.